My name is Faith. I'm a business owner, wife to my best friend Chandler, dog mom, plant based, health & wellness enthusiast, and creator. Here you can find posts on health, recent travels, my favorite plant based recipes, and more! 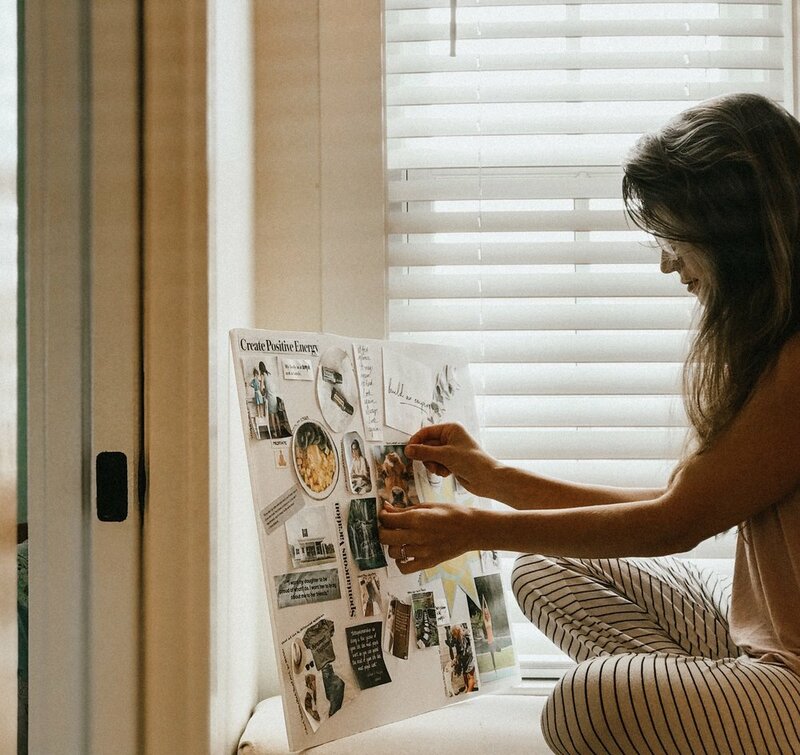 Why a Vision Board Can be a Game Changer For Your Goals & How to Make One! So when you first think about sitting down with a bunch of magazines to find things that are relevant to you and your goals, cutting them out, and gluing them to a poster board, it might seem a little silly and maybe even a bit childish. I kindof thought so too but I just kept hearing “put your goals down on paper”, “get them infront of you where you can see them everyday”, “what you focus on is what you will manifest.”, etc. I listen to a ton of podcasts, read books, and watch videos on goal setting, habit forming, and all things motivational and this is one thing that I hear over and over again. We need to be putting our goals and aspirations for our lives where we can see them daily and we need to be writing them out daily as well. Our minds are SO powerful and what we are constantly looking at, writing out, and feeding our brain daily MATTERS and will start to show up in all areas of our life. Life, Marriage, Business & College! Life has been so exciting lately. My husband Chandler and I are nearing our 1 year anniversary (6 more days, woo hoo!!) and couldn't be more excited to celebrate that together. We leave at the end of the week for South Carolina. We're going to be staying in an adorable little Airbnb in Greenville for a couple nights and then heading down to Charleston for the last half of the trip. So much has been happening in our lives lately and it will be nice to getaway and just be together and breathe. One year has gone by so fast and we are realizing how important it is to really take full advantage of any quality time we can get. I'm so looking forward to unplugging and adventuring with my sweet husband for a week to celebrate our first year of marriage! Your first year is quite a big deal and I guess that's why I've really felt the need to write an update lately! Marriage is so incredible. It's something so intricately and perfectly designed by our creator. The first few months are definitely an adjustment period but I truly feel like the Lord has had his hand on us and has continued to have his hand on us and is daily molding us. We definitely fail each other, but it's the constant fight to get better for each other and glorify God with our relationship that has kept our love stronger than ever. It felt like the Lord used my husbands question to say, "Yes. That's it." Now I know reading that may seem like this was super out of the blue but health and fitness have always been a HUGE part of my life and a strong passion of mine but more specifically the natural side of health care and medicine. It's always been a dream of mine to own a spa and now looking back at that dream, it lines up perfectly with where God is calling me. This is honestly something I've been passionate about for so long. Ever since I was old enough to do research I was looking up natural remedies and different methods of healing, the different teas to drink for whatever's going on in your body, why our bodies shouldn't be pumped full of antibiotics and other drugs, what the best foods are to eat for certain things, etc. I was amazed. The fact that the Lord was pointing me in this direction made such perfect sense. I couldn't believe the accuracy but I shouldn't have been surprised. He knows me better than anyone else and has planted dreams an passions in my heart all throughout my life to lead me to the next thing, the next piece in the puzzle. Another thing I should probably mention is that I have always hated school. Always. I was in college for 2 years pursuing a degree in graphic design and even though thats what I thought I should be doing and really the only degree that fit any of my passions, it just wasn't right and I felt that in almost every class I was in. I felt out of place. I couldn't handle that for too long so I finally decided to take a break. During that break Chandler and I got married, I continued with my small businesses, which I love doing, and never once thought about going back to school. Now looking back at it, I know I would've been very drawn towards naturopathic medicine or anything of that sort if it had been an option but it never was at the schools around me. I never even considered that it could be because it is still an up and coming field. Which is ok because obviously that wasn't God's timing. Fast forward a bit and now a Bachelor of Science degree in Alternative Medicine is something that's offered online at a few different schools and that's what I felt God was calling me to. He has used this passion that he ignited inside me way early on in life to change my perspective into one that is now ecstatic about going back to school, and guess what? Yesterday was my first day! I am in a nutrition class and learning about things that I am actually passionate about. It feels really good. I was actually laughing with my husband and my mom the other day because whilst in one of my graphic design classes a few years ago, we were told to make a linear color wheel out of anything we wanted. I chose herbal tea leaves. (pictured below.) 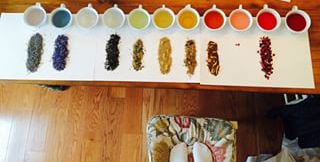 I spent endless amounts of time researching different teas and herbs and of course their different colors. I thought it was pretty funny that even in an art class, this passion towards herbal medicine and natural healing was showing. It's so funny how God works. If someone was to ask me what I'm going to do with this degree, my short answer would be that I would open up a spa/wellness center. Now whether I'll go into that as a naturopathic doctor, chiropractor, massage therapist, etc. I am not entirely sure yet. I am starting with this and seeing where God leads me through it. I am currently doing a 40 day prayer challenge and have been continuing to pray about what happens next and where this degree will take me. As for my two babies, Kristina&Co jewelry and Faith Kristina Designs, they will definitely remain open. I still love my businesses and will continue to pour my heart into them while in school. I'm looking forward to continuing these blog posts and keeping anyone posted who wants to be kept posted. I will also be sharing a few more health, fitness, and lifestyle related posts on here as well. Thanks so much for reading!